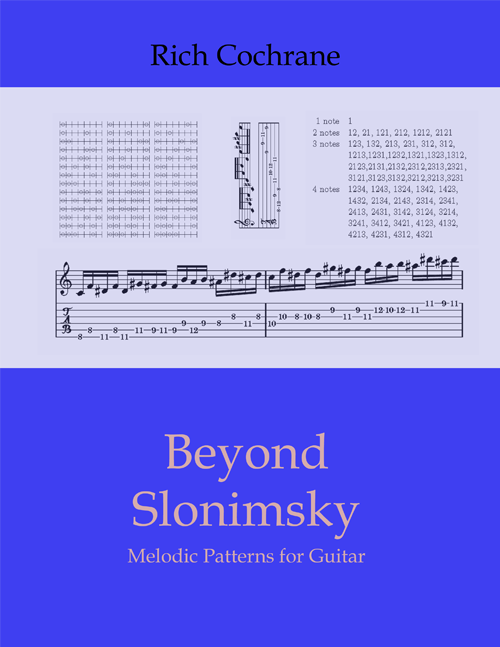 Nicolas Slonimsky's Thesaurus of Scales and Melodic Patterns is a legendary book that has influenced musicians as diverse as John Coltrane, Jaco Pastorius, Frank Zappa and Buckethead. Many guitarists (and others) own a copy, but few have got much advantage from it. Even advanced players claim it's difficult to use, dry and dauntingly long. This free, 400-page ebook is designed to help in three distinct ways. The first is that is gives a completely new account of the theory behind the first twelve chapters of the Thesaurus, the most widely-used and systematic part of the book. This is done in a clean, modern and rigorous way that completely does away with Slonimsky's quirky and offputting terminology and that significantly extends his original idea. Furthermore, it's designed to show you how to understand the resulting patterns from the inside out, enabling you to come up with your own and even do so on the fly, without any prior preparation. The second is that the resulting patterns -- which are similar, but not identical, to those contained in the Thesaurus are organised by the pitches they contain rather than Slonimsky's theoretically-pleasing but abstract octave divisions. This makes them much easier for most contemporary musicians to apply to real-life situations. To make them even more practical, all examples are presented in traditional notation and tablature, making the book very easy for guitarists to experiment with quickly and easily. The third is that the book extends the Slonimsky's "recipe" to "non-symmetrical bases", and presents a selection from the almost unlimited possibilities this makes available. Slonimsky's Thesaurus is one of the most talked-about books in music. Maybe you even have your own copy, gathering dust somewhere. Beyond Slonimsky will encourage you to get it out and start using it in a more practical way than ever before.